We’re all the same in the most fundamental ways. It matters little what your religion is, what your color of your skin is, what region of the world is your background, what your culture is, what your tradition is, what your history is. What matters most? Family, peace, opportunity, some ability of some human dignity, to express that dignity, to express your opinions, to express some sense of liberty, your own choice. That’s not unique to Christianity or Judaism or Islam, that I’m aware of. It is a common interest; it is a common purpose for all mankind. 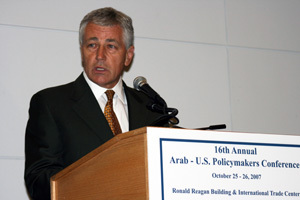 Senator Hagel’s complete remarks are available below.